The destruction rent by super-typhoon Mangkhut on the Philippines, Hong Kong and mainland China in mid-September underlined a sad reality: once-in-a-lifetime weather events are becoming increasingly common. The severity of natural disasters is on the rise, courtesy of decades of carbon dioxide pollution heating the atmosphere. Most meteorologists agree that a hotter world increases how much water typhoons absorb and then dump onto villages, towns and cities. Mangkhut’s advance killed scores in the Philippines is estimated to have caused billions of dollars of damage in Hong Kong and mainland China. Such super-storms are likely to become more frequent. Record average monthly temperatures were recorded across many parts of the world this year or last. Under even the most optimistic scenario, targeted by the Paris Agreement on Climate Change in 2015, global temperatures are predicted to rise by up to two degrees centigrade by the end of the century. That will mean more severe storms, flooding, droughts, and damage to coastal cities. Such visible signs of environmental catastrophe offer compelling reasons for institutional investors to consider responsible investing. Increasingly, a financial reward is unlikely to be their only goal. That is where ESG comes in. Environmental, social and governance (ESG) principles are essentially a spotlight on corporate values or types of behaviour. Investors who use them typically apply sets of metrics to measure how much companies adhere to these values, be they minimising carbon emissions, prioritising workforce rights or placing shareholder rights on a pedestal. Climate change is an integral part of ESG, but it is much broader than just that. Asia’s most vocal institutional investor proponent of ESG is Japan’s Government Pension Investment Fund (GPIF). A spokeswoman for the world’s largest pension fund told AsianInvestor it had engaged with ESG activities for a simple reason: long-term stability. “The longer ESG risks persist, the more likely they will materialise. Therefore, we consider that it has great benefits for GPIF to integrate ESG factors into its investment process as a super long-term investor responsible for supporting pension finance, with an investment time horizon of as long as 100 years,” she said. GPIF’s full-throated endorsement of ESG, combined with its sheer size, offers a compelling argument for fund managers to adopt such principles. As calls to combat climate change rise, other Asian asset owners will feel pressurised to follow. “European institutions have traditionally been the worldwide leaders in ESG, with the US and Asia Pacific following. But we believe that GPIF taking this major step could catalyse investment in Asia Pacific and eventually put it on the same level as other regions,” said Reid Steadman, managing director and global head of ESG indices at S&P Dow Jones Indices. But there’s a long way to go. “Incorporation of ESG into investment decisions, including in specific mandates and manager decisions is still getting started in Asia,” admitted a spokeswoman for the United Nations-supported Principles for Responsible Investing (PRI), widely seen as the body that sets the agenda for pushing ESG considerations around the world. Increasing the knowledge and comfort of asset owners with ESG concepts will play a vital role in ensuring it flourishes in the region. The concept of ESG is an offshoot of the decades-old concept of corporate social responsibility, or companies’ responsibility to consider their impact on the community and environment, but places a greater onus on investors to assess how they invest. The most active institutional investor proponents of ESG are based in Europe, and particularly Scandinavia, along with a handful of institutional investors in Australia and New Zealand. Pension funds and sovereign wealth funds (SWFs) in these regions have increasingly demanded ESG considerations when making investments, internally and via external fund houses. Investing strategies vary. One of the most common, and basic, is known as exclusion, or negative screening. In essence, asset owners or fund managers elect to avoid certain industries that are deemed too pollutive, corrupt, or destructive in their business activities. Asset owners such as Australia’s Future Fund, refuse to invest into tobacco or arms manufacturers, while Norway’s government pension fund, with NOK8.47 trillion ($1.04 trillion) in assets, excludes weapons makers and coal producers. The approach has the advantage of being simple to understand and implement. But critics note, with some justification, that removing entire segments of the investment universe can hurt investment returns. Some asset owners argue that this undermines their fiduciary responsibility to deliver as good investment returns as possible to their stakeholders. While this argument ignores longer-term problems such as environmental degradation, it can be seductive for pension funds and insurers that are cautious about engaging with ESG. Another option is ESG integration. This approach applies ESG metrics to individual stocks and assigns them a level of risk, which affects their risk-adjusted appeal. The idea is to include all companies but make clear which are most exposed to pollution and stricter environmental rules, or lack sufficient information disclosure or management diversity. This approach provides a more nuanced approach to ESG and can help investors identify potential outperformers – and avoid companies that are vulnerable to drops in value. But ESG integration is also more complex, which can make it more intimidating to asset owners that are just beginning to engage in this space. Other forms of ESG strategy include positive screening – identifying companies that hold exemplary ESG credentials – and impact investing, which involves investing into projects with a direct environmental or social good that also provide a return. Increasingly these approaches are also gaining interest. The Global Sustainable Investment Alliance (GSIA), another ESG-focused agency, noted in its latest 2016 report that the most common strategy for sustainable investing in Asia ex-Japan is ESG integration, representing $24.5 billion of assets, followed by negative screening, with $18.8 billion in assets. However, sustainability themed investments were the fastest growing strategy, with an annualised growth rate of 73% from 2014 to 2016, while negative screening grew at 7%. While asset owners in Europe, Australia and New Zealand have actively embraced ESG, the concept has enjoyed most success among the largest asset owners in the rest of Asia. Japan’s GPIF has been by far the most assertive. In July 2017 it assigned ¥1 trillion ($8.86 billion) of its equities to track two ESG-linked stock index benchmarks from MSCI, and one from FTSE Russell, then in October 2017 it partnered with the World Bank Group to promote sustainable investments. Most recently, on September 25, 2018, GPIF said it would invest $10 billion in equities via two newly-launched stock indexes from S&P Dow Jones Indices, which focus upon carbon efficient companies. More importantly, while GPIF uses external managers to invest all its assets, it insists that they display detailed information about how they incorporate ESG activities into their investment processes, and this comprises a key part of choosing which ones to employ. Thailand’s Government Pension Fund (GPF), its largest pension fund, takes a similar position. The pension fund sought to introduce ESG as a pilot project in late 2016 and it has quickly evolved. Yinyoung Chiaravutthi, the CIO, told AsianInvestor the Bt843.16 billion ($25.52 billion) fund places an overlay of ESG considerations over all of its investing plans. Plus it teamed up with the Stock Exchange of Thailand in July 2018 to promote locally listed companies that focus on ESG practices. Another leading regional pension fund, the Bureau of Labor Funds (BLF), has been more measured in its embrace of ESG to date. At the end of August it had NT$56.7 billion ($1.86 billion) in three external ESG local stock mandates, with space to add another NT$57 billion. It has also placed $20 billion into a global ESG index mandate since June 2016, and could add more depending on market conditions and its asset allocation plans. Other sizeable asset owner advocates of ESG include the likes of Malaysia’s Employees’ Pension Fund (EPF) and Kwap. Both have offered multiple ESG investment mandates to external fund managers. New Zealand Super (NZ Super) is another strong proponent. Under former chief executive Adrian Orr, the sovereign wealth fund announced in 2017 it intended to cut its carbon emission intensity by at least 20% and reduce its carbon reserves exposure by at least 40% by 2020. It began by looking to cut the carbon exposure of its global passive portfolio and is looking to extend this to its active portfolio. These are important steps to encourage renewable energy production. 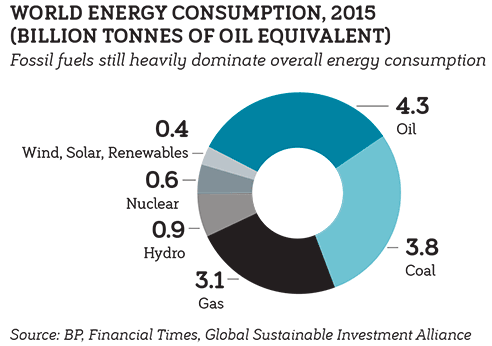 Despite rapid growth, it provides a miniscule amount of global energy consumption (see charts). Despite these champions of ESG incorporation, most asset owners in Asia Pacific have yet to seriously engage with the concepts. PRI is generally recognised as being responsible for universalising ESG investment principles, and investors willing to adopt ESG tenets typically become signatories to the organisation’s principles. Globally, the organisation has 394 asset owner signatories and 1,471 investment managers. Within this, Asia Pacific is seriously under-represented. Just 62 asset owners are based in the region, and they are only situated in five countries (see chart). Notably, there are none in mainland China, the world’s second-largest economy, or in India, the fourth-largest. The region has 205 regional investment manager signatories, but even that is just 14% of PRI’s global total. Just 11 are in mainland China, while five are based in India. By some indications the embrace of ESG may be slowing, at least outside of Australia and Japan. The GSIA’s 2016 report estimated sustainable investment in Asia ex-Japan to grew by 16% from 2014, to reach $52.1 billion in assets. But that compared to the 32% it recorded from 2012 to 2014. That said, AsianInvestor’s new AI300 survey of the region’s largest asset owners offers reasons for hope. In total, 61.7% of non-bank respondents said they were incorporating ESG principles across entire portfolios or in selective asset mandates. Just 14.9% said they don’t plan to use them at all (see story on pages 42-47). There are practical reasons that limit investors’ embrace of ESG. Hiring qualified personnel and integrating analytical tools can be time-consuming and expensive. And despite mounting evidence of climate change, investors often lack the initiative to embrace ESG unless powerful and influential internal advocates push for it – or they are forced to by political or regulatory diktat. Mainland China offers one example. While Beijing has extolled green finance and green bonds, none of its asset owners have yet signed up to PRI. “It’s hard to argue that Beijing is fully committed to ESG until its own pension funds use the concepts to invest,” said a senior institutional salesperson familiar with the country. But there are also signs of progress. Since 2014 several jurisdictions, including Japan, Hong Kong, Singapore, Malaysia, Taiwan and Korea, have adopted stewardship codes for their equity markets. These codes consist of voluntary principles for institutional investors, and are designed to improve the quality of engagement between them and companies (essentially the ‘G’ part of ESG). Additionally, the HKEX and SGX, operators of Hong Kong and Singapore’s respective exchanges, have applied ‘comply or explain’ ESG information disclosure requirements of their companies. These steps make it easier for investors to analyse ESG information from companies, or note which do not divulge it. There have been other encouraging signs. Japanese prime minister Shinzo Abe penned an editorial in the Financial Times on September 23, 2018, extolling GPIF’s efforts in combating climate change and asking other countries to participate too. The Hong Kong’s government’s seeming indifference to ESG also changed in September. The official launch of the Hong Kong Green Finance Association on September 21, 2018, was headlined by a speech from Hong Kong chief executive Carrie Lam. She underlined the territory’s desire to become a centre for green finance, particularly green bonds. Ashley Alder, CEO of the Securities Futures Commission, was also a speaker, and the securities regulator launched a framework on environmental guidance for corporates and asset managers in Hong Kong on the same day. Such steps are helping to raise ESG and climate change as legitimate concerns in the minds of institutional investors. More of them recognise the need to better educate themselves and experiment on how best to invest. While ESG remains a largely focused on equities investments, this is slowly changing. The proliferation of green bonds from mainland China is exposing more bond investors to ESG considerations. Banks in mainland China, Hong Kong and increasingly Japan are looking at ESG lending practices. And GPIF’s work with the World Bank is including research to create fixed income ESG benchmarks. ESG-compliant fixed income portfolios are likely to gain interest in the years to come. While many new adopters are likely to begin with specific ESG equity mandates, its true value is best realised once it is incorporated across an entire investment portfolio. That helps asset owners understand how exposed they are to individual companies with environmental shortcomings, poor governance standards, or a lack of sensitivity to social conditions. In other words, it’s a form of risk management. Businesses that don’t pay sufficient attention to their environmental frailties, or ensure strong internal governance and information disclosure, are at greater risk of falling afoul of tougher environmental rules, or to hide questionable internal practices. There are myriad examples of this. Social media giant Facebook saw its market capitalisation fall $145 billion in aftermarket trading on July 25, 2018, after it reported disappointing user growth in key markets. This had followed months of bad headlines about it having allowed bad actors to permeate its service with fake news and illegally use data it had acquired. Electronic car maker Tesla also suffered after its mercurial founder and CEO Elon Musk made abrupt claims on Twitter on August 7, 2018 to be looking to take the company private. The announcement came before Tesla’s own board, and Musk’s failure to inform the US Securities and Exchange Commission led to it suing him for fraud on September 27, 2018. ESG metrics, when applied correctly, can help disclose what buffers companies have against such poor behaviour and help investors choose whether to limit their exposure. It can also help identify firms that rank better, and are thus less risky. As pressure mounts on pension funds and other asset owners to maximise returns, it’s increasingly important for them to manage risk. By adopting ESG, they may reduce their exposure to turbulence – whether it be meteorological or corporate in nature. Across Asia, seven jurisdictions have to date implemented stewardship codes, or policies to encourage investors to engage with investee companies via voting and conflict of interest management. Hong Kong and Singapore are two of them. And in addition, the operators of the Singapore Exchange (SGX) and Hong Kong Exchange (HKEX) have over the past two years encouraged listed companies to comply with their respective environmental, social and governance (ESG) requirements. Both exchanges require listed companies to adhere to ESG comply or explain rules in their annual reporting. Singapore introduced this requirement in the 2017 financial year, one year behind HKEX. The SGX consulted widely prior to making ESG requirements mandatory via surveys, industry consultation and workshops. It also sought advice from core institutional investors. Earlier in 2018, HKEX conducted a random ESG survey of 400 of its listed companies. On the plus side, 100% of respondents said they had reported their ESG information. But there were also areas of concern, such as the need for greater board involvement in the ESG process and to improve the overall quality of compliance in both approach and principle. Currently the SGX and HKEX are choosing to encourage companies to disclose ESG information than force them to do so. Tang says the SGX’s priority is to convince companies to buy into these requirements, similar to the HKEX. The trend in Europe is for companies to self-police their ESG commitments without strict regulations and penalties. But the HKEX is more prescriptive: it has 79 code provisions providing a step by step guide for listed companies to comply with regulatory requirements. This approach is likely to be followed by mainland China, which intends to make environmental disclosure mandatory from 2020. Mainland China has a somewhat complicated relationship with environmental, social and governance (ESG) principles. 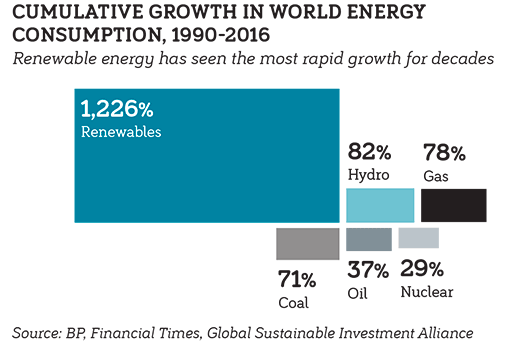 The nation’s remarkably successful focus on economic growth during the 1990s and 2000s came at the cost of it becoming world’s biggest carbon emitter. A combination of successive environmental scandals followed, and by 2015 independent agency Berkeley Earth estimated mainland China’s air pollution was causing 1.6 million deaths a year*, and that 75% of its water and 20% of its arable land was contaminated. To clean up its environment, Beijing aims to spend at least $600 billion a year on green financing, 10% of which will come from the state and the rest from the private sector., Ma Jun, chief executive of the Hong Kong Green Finance Association, said at the organisation’s launch on September 21. China is making progress; its borrowers account for about 12% of the $70 billion in global green bonds issued to date. Mainland China’s interest in green bonds has been emulated by other emerging markets. “The region’s leadership in green bonds has been intriguing, with both mainland China and India engaged in issuing green bonds and other markets including Vietnam expected to do so too, while in Malaysia there is interest in sukuk green bonds,” said a spokeswoman for United Nations Principles for Responsible Investing (PRI). Green bonds appeal to investors because they are directly tied to efforts to tackle environmental concerns such as carbon emissions, while issuers like them because they often cost less to issue than equivalent vanilla bonds. Hong Kong, once indifferent to ESG, has sought to benefit too. September 21, 2018 witnessed the launch of the Hong Kong Green Finance Association, during which chief executive Carrie Lam announced the government hoped to launch up to HK$100 billion ($12.76 billion) in green bonds, underpinning its effort to become a centre for green finance. But mainland China’s commitment is not yet absolute. Local asset owners, for example, haven’t yet shown much desire for such products. There are also questions about how seriously the country will engage on the ‘G’ part of ESG. On the positive side, the China Securities Regulatory Commission said all listed mainland Chinese companies must mandatorily declare their environmental plans and spending by 2020. “If no other countries raise their standards, that would make China the most demanding regime in the world,” Ma told AsianInvestor. Additionally, index provider MSCI introduced A-shares into its Emerging Markets Index in 2018 and then launched ESG ratings for these shares. Wang Xiaoshu, head of Asia Pacific ex-Japan ESG research at MSCI said it has to date gained information from about 10% of A-share companies included in its index, or 19% of Chinese firms with shares listed in mainland China, Hong Kong or internationally. But it’s not certain how rigorous, well monitored or enforceable accurate disclosure of ESG information in mainland China will be. Many observers don’t even trust China’s provincial GDP data, so it’s hard to imagine the country’s environmental data will be taken at face value. Nevertheless, Beijing’s desire to push ESG is causing local fund houses to engage. In July the Asset Management Association of China released a consultation paper how external managers can identify and supervise assets for ESG funds. Additionally, 11 mainland Chinese asset managers have signed up to the PRI and one of them – E Fund Management – worked with Europe’s largest pension asset manager and administrator APG, on an ESG China strategy. E Fund also intends to launch a new China A Share environmental index strategy in collaboration with State Street Global Advisors. For a next step, PRI has suggested China develop its own stewardship code, following steps by markets such as Japan, Hong Kong and Taiwan.